CUPERTINO, California―January 7, 2013―Apple® today announced that customers have downloaded over 40 billion apps*, with nearly 20 billion in 2012 alone. The App Store℠ has over 500 million active accounts and had a record-breaking December with over two billion downloads during the month. Apple's incredible developer community has created over 775,000 apps for iPhone®, iPad® and iPod touch® users worldwide, and developers have been paid over seven billion dollars by Apple. "It has been an incredible year for the iOS developer community," said Eddy Cue, Apple's senior vice president of Internet Software and Services. "Developers have made over seven billion dollars on the App Store, and we continue to invest in providing them with the best ecosystem so they can create the most innovative apps in the world." In 2012, the husband and wife team at Imangi Studios saw their game Temple Run downloaded more than 75 million times; Backflip Studios and Supercell, two emerging game development studios, brought in over $100 million combined for their leading freemium titles DragonVale and Clash of Clans; and emerging services including Uber, Flipboard, HotelTonight, and AirBnB attracted millions of users on iOS. 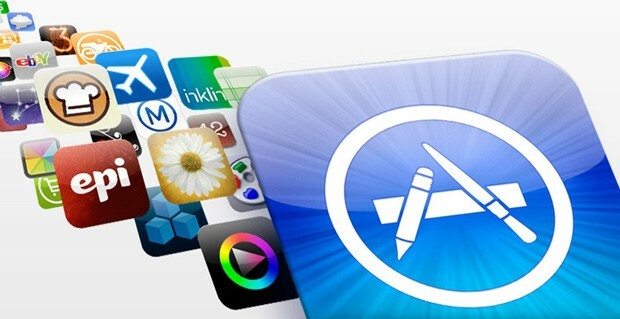 Companies including Electronic Arts, Ubisoft, Autodesk, Marvel and Major League Baseball continued to expand their iOS offerings, while developers like JJ Abrams' Bad Robot Interactive and Bottle Rocket Apps continued to push the boundaries of what iOS apps can do. "The success of our game Temple Run in 2012 was nothing short of astonishing," said Keith Shepherd, co-founder of Imangi Studios. "We were simply looking to create a game that was fun and easy to play, but once it hit the App Store, the game took off. This past year, we saw more than 75 million downloads of Temple Run on iOS." "Our success on iOS has been incredible," said Samir Hanna, vice president of Consumer Products for Autodesk. "We set off with the modest goal of bringing SketchBook to iPhone users as a way of introducing them to Autodesk. Fast forward three years, we now offer 20 apps to iOS users that have achieved more than 50 million downloads, and we continue to roll out new creativity and design tools that appeal to both professionals and consumers." "The App Store provided us with opportunities beyond our wildest dreams," said Bad Robot Interactive's JJ Abrams. "Our app Action Movie FX was designed to bring Hollywood special effects to anyone's self-made video, whether that be on an iPhone, iPad or iPod touch, and we're just thrilled that millions of fans around the world were as excited as we were about the possibilities that this app brings." "Bottle Rocket Apps now employs over 100 full-time employees, dedicated to nothing but building great apps," said Calvin Carter, president of Bottle Rocket Apps. "In my 20 plus years in technology, I have never seen such a vibrant marketplace for software like the App Store."